Can You Grasp The Sparrow’s Tail? When tai chi chuan students learn and practice “Grasp the Sparrow’s Tail” (also called “Grasp Bird’s Tail”), they learn that the four movements are expressions of: ward off (peng), roll back (lu), press (ji) and push (an) (1). The importance of these movements is illustrated by Wong Kiew Kit 2. 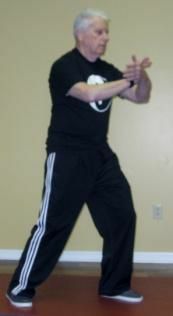 Wong reports that Yang Lu Chan, the patriarch of Yang-style Tai Chi Chuan, after defeating all the masters he met, earned the title, Yang the Ever Victorious. According to Master Wong, Yang Lu Chan used “Grasp the Sparrow’s Tail” as his principal move. Master Wong describes the postures as the “four primary Tai Chi Chuan hand movements” (2) (p.56). As students flow through the four movements, Master Wong explains how the force starts at the foot, is controlled by the waist, is expressed at the hands, and is executed from the spine. This delivery of force is executed with “full mindfulness” (p. 56). The four postures are presented below. When university students studied the course, “Taoism, Tai Chi and Mindfulness,” their tai chi training focused on experiencing both gentle exercise and moving meditation. Master Wong devotes chapter 21 of his book to Taoism and spirituality (2), whereby he describes tai chi’s relationship with the Tao Te Ching’s verses. 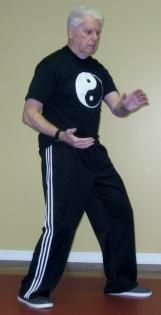 In another section, Wong emphasizes the importance of learning the essential principles of qigong (Chapter 6) as a path to receiving the full benefits of tai chi prompted the inclusion of The Eight Pieces of Brocade Qigong in the course (3). 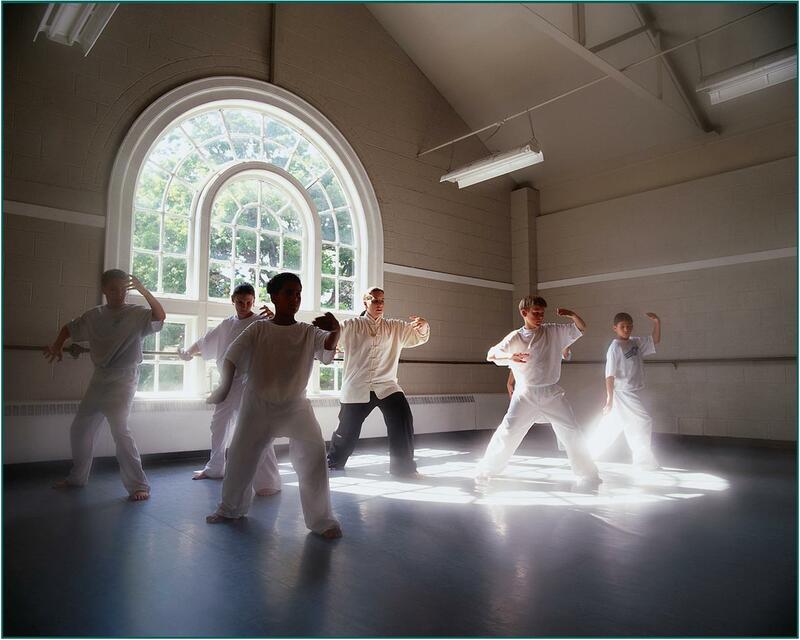 For three mornings each week during the semester, novice tai chi students gathered in the university’s dance studio to learn and practice qigong and tai chi. During the third week of tai chi instruction, (we learned the Yang 24 Forms, also called the Simplified Tai Chi Set) “Grasp the Sparrow’s Tail” was taught (4). Readers familiar with Yang 24 Forms will recall that this form occurs at movements 7 and 8. Along with their instruction in the studio, students were assigned written reflections on their experiences with qigong and tai chi (see McBrien & Gutierrez) (5). Here is the assignment. The reflection follows. Take time to find your personal quiet space and take a few minutes to warm up using tai chi principles. Stand in the wu chi posture for about 10 or more slow deep breaths. Perform “Grasp Sparrow’s Tail” to the left and the right (just as we do performing Yang 24 in class). Move slowly, breathe into the belly and allow yourself to relax completely. Repeat the movements at least four times. Take a moment or two to stand in wu chi and breathe slowly. Now you are ready to write. Reflect on how the verse from the Tao Te Ching is expressed while performing Grasp Sparrow’s Tail. Learning Yang 24 with the goal of developing a mindful awareness, students are encouraged to become aware of what is experienced when employing the essential principles. 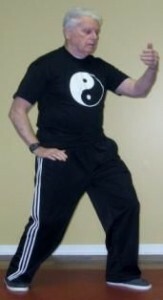 Emphasis on standing in wu chi at the start of each class helps learners move towards mastery of this “keystone” posture. 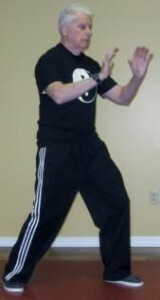 This posture is also emphasized in qigong. 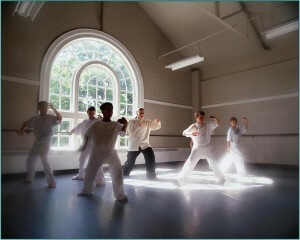 Within the first two weeks of the class, students, on arrival to the studio, were able to quietly stand in wu chi as they waited for class to begin. It was very satisfying to see the students take their place, stand with feet parallel and about shoulder-width apart, slightly bend their knees, tuck in their tail bone, and stand straight with head gently held high. Learning to relax the shoulders down and broaden the back was a challenge for some. Most were taught to stand with a “proud chest.” This was a habit that needed to be changed. Using the imagery of holding an egg in each armpit was helpful. Below, Natasha’s reflection as she practiced the four postures of “Grasp the Sparrow’s Tail” begins with her experience with the wu chi posture. When I stand in the wu chi posture and I feel the heaviness of my feet rooted on the floor, I feel more secure with my practice of tai chi. I am able to feel the control of my movements in a heavy manner than when I do not try to position myself correctly in a light way. I have noticed that if I do not place myself correctly and if I do not feel firm, I usually end up losing my balance, which disrupts chi flow. This is not the right “way of energy.” However, when I am positioned to my comfort level and I am firmly grounded, I feel in control of my forms and my forms are able to flow gracefully like they should. Whenever I want to practice any form, I always start in the wu chi position, since it is better to feel much more balanced than if I just go straight to the form. Learning and practicing “Grasp the Sparrow’s Tail” has several challenges. Maintaining the “bow and arrow” stance while moving through the four hand postures seemed daunting for some students. 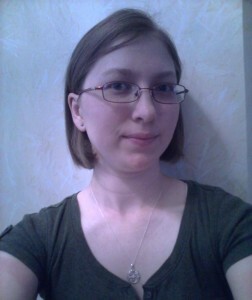 We learn how the reading of Verse 26 helps Natasha overcome this challenge in her practice. So, when I want to do “Grasp Sparrow’s Tail” and I want to feel my feet rooted, sometimes I have to shift around until I feel the right spot. As I perform “Grasp Sparrow’s Tail,” my rooted posture allows me to gain confidence and do the movements to my liking. Though my left side is fine, I feel that my right side still needs more practice, but if I stay rooted and focused, I should be able to perform the right side just as well as my left side in good time. As we read the reflection, we appreciate how Natasha understands that the Tao Te Ching brings a deeper understanding to her experience as she does tai chi. When Verse 26 states that “[t]he heavy is the root…; [and] to be light is to lose one’s root”, this definitely applies to my learning of tai chi because when I am rooted, I do not lose my control. When I have control, I am able to be “the master of unrest”, which makes me feel more accomplished about my practice of tai chi. Yang Chengfu (2005). 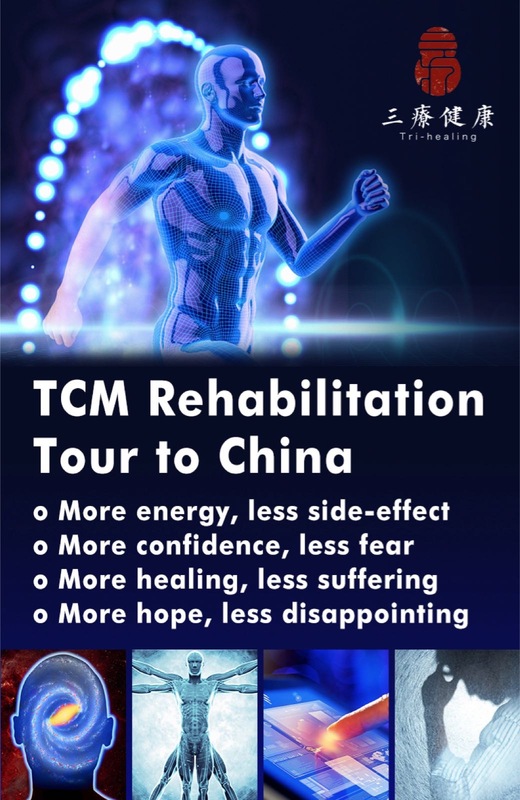 The Essence & Applications of Taijiquan. Berkeley, CA: North Atlantic Books. Wong Kiew Kit (2001). The Complete Book of Tai Chi Chuan. Rutland, VT: Tuttle Publishing. Yang, Jwing-Ming (1997). 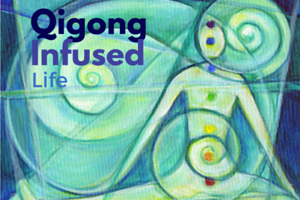 Eight Simple Qigong Exercises for Health. Jamaica Plan, MA: YMAA Publication Center. Lam, Paul. (2011). Tai Chi The 24 Forms (DVD). Burlison,TN: Tai Chi Productions 5. McBrien, B. & Gutierrez, V. (2013). Can You Be Like Water? in Yang-Sheng Volume 3, No. 4 Aug-Sep 2013. Natasha Shangold graduates from Salisbury University in May 2014 with a B.A. in Environmental Studies and minors in Religious Studies and Biology. She would like to work in Environmental Education. 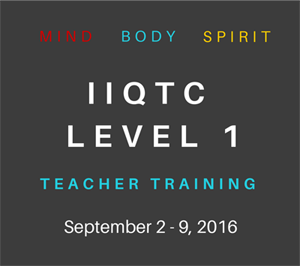 Though she has always appreciated keeping her qi in balance, this course was her first experience with tai chi and qigong. 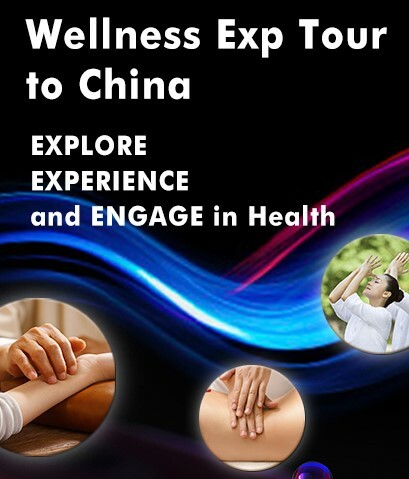 This entry was posted in Experience Exchange, Tai Chi and tagged Bob McBrien, tai chi, taiji, yin yang. Bookmark the permalink.